Saturday's update gave us several new features. Among them, you can now disable the security deposit for your property or a specific quote. To disable the security deposit, navigate to your property, select the Billing Details link and click the Change button. 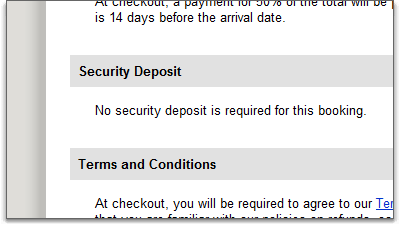 You'll notice a new set of options in the Security Deposit section. 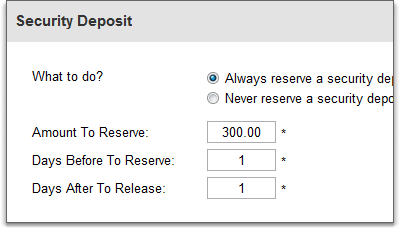 Select the 'Never reserve a security deposit' option and click Save. Future quotes and bookings will no longer create security deposits or tell the guest about them. The public quote form, where the guest accepts and finalizes their reservation, will tell the guest that no security deposit is required. To disable the security deposit for a specific quote, navigate to the quotes, select the Billing Details link and click the Change button. This area is similar to the billing details on the property only whatever you set here only applies to the specific quote in question. Why would you want to disable it for a specific quote? Say you have a friend that is renting your property, and you trust them and don't want to impose a security deposit on them. Instead of turning it off at the property level, thereby turning it off for all quotes and bookings for all guests, you can just disable it for your friend's quote. Your friend will never see it when they're accepting and finalizing the quote online and no security deposit is ever scheduled or reserved.